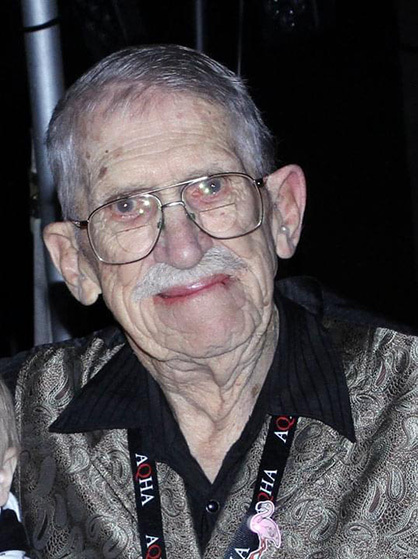 AQHA Director Emeritus Col. Earl A. Lilley, 97, of Emmett, Idaho, died August 28. Earl was born on February 21, 1921, as the second-youngest of seven children of George E. and Katherine Lilley. He grew up during the Great Depression, and learned the importance of a big garden to feed a family (a hobby he continued throughout his life), and was also introduced to horses by driving work teams in McClellandtown, Pennsylvania. Unbeknownst to his mother, a young Earl had taken private flying lessons, and when World War 2 broke out, he rushed to the recruiting office. However, as he was too young to enlist, and his mom refused to sign for him, he married his high school sweetheart, Lola, who agreed to sign for him. He served in the Air Force for 28 years, with love and dedication to his country. During World War 2, he completed 50 missions without losing a crew member. He received the Distinguished Flying Cross for heroic bravery for nursing a crippled bomber back to base, landing with only two of its four engines surviving. He served with the 509 Composite Wing, which is the outfit that dropped the atomic bombs on Hiroshima and Nagasaki. Lilley himself flew a modified B-29 that captured camera footage of atomic bomb testing in the South Pacific. He served as a pilot instructor in B-24s, B-29s and T-33 jets, and piloted the last B-47 from Mountain Home Air Base near Boise, Idaho, to the aircraft graveyard near Tucson. He estimated that he flew more than 10,000 hours during his enlistment. He retired as a Colonel in the Air Force. His wife of nearly 60 years, Lola, faithfully traveled with him wherever his service took him. They had four children, Jim, Terry, Melody and Kathy, and his family meant the world to him. The Lilleys settled in Emmett, Idaho, and embraced Gem County as their home. Lola died in 2000. Col. Lilley was a passionate supporter of American Quarter Horse activities around the world, as well as his home state of Idaho. He always loved horses and enjoyed them every chance he got. He was able to become an owner, breeder and supporter when he retired from military duty. A longtime owner and breeder, Col. Lilley was actively serving on the AQHA Racing Committee and took pride in attending the AQHA Convention every year for 50 years (missing only one time due to an emergency), making sure he had fun and danced at each of them. He was active in Idaho racing and politics, and supported the racing industry and the Idaho Horse Council, where he served as president. Among the horses he raced was the stakes-placed mare Lady Iron, who set a 350-yard track record at Humbolt Co. Fair. In 2008, Col. Lilley was honored with the Merle Wood Humanitarian Award from AQHA. Col. Lilley was a passionate supporter of the Gem County Senior Center, where he also served as president. There, after Lola had passed, he had a place to go dance, laugh and hang out with his friends. And it was there that he met Jo Fisk, whom he married in 2014. Together, they enjoyed traveling, dancing, eating and enjoying life. He did not know a stranger, and always had a smile, hug or handshake for every person he met. On August 25, he started to have some heart issues that took him to the hospital; he kept singing “I Wanna Go Home,” and made those around him smile and laugh. He was able to return to his home for one more day. He was preceded in death by his wife Lola, and grandson James, and his parents and numerous siblings. He has one sister living, Mable, his children, Jim and (Katha) Lilley, Terry Smith, Melody Rose and Kathy and (Scott) Freeman, James Fisk and Teresa Jones. His two adopted girls, Genie Mittleider and Candi Witzel. His grandchildren Patti Jasso, Stacey Wescott, Pete Rose, Dan Rose, Melissa K Price, Larenzo Freeman, Bridger Fisk, Carson Fisk, Jocelyn Fisk and Michael Lincoln and his great grandchildren are Christopher Walker, David Jasso, Donavon Lara, Max Wescott, and Hanna Rose, and Bryson James Freeman. A visitation will be held on Wednesday, September 5, from 5 to 7 p.m. at the Potter Funeral Chapel in Emmett. Services will be held at 2 p.m. on Thursday, September 6, also at the Potter Funeral Chapel. In lieu of flowers, the family requests donations in Col. Lilley’s name to the local Idaho Quarter Horse Youth Association or Gem County Senior Center.